At Whisky Live 2018 in Singapore, the Gordon & MacPhail booth is a great opportunity to sample fine whiskies and then pic the select one that might just make it home to Mumbai. This colourful case flags that the Miltonduff is part of Gordon & Macphail’s new Discovery range – intended to explore the distinctive styles of sherry, peat and bourbon. In this case – it is a sherry cask. My first brush with Miltonduff was part of the Ballentine’s 17 year old special box set featuring different component distilleries. This was followed by a Single Cask 21 year old. And what would this set you back? At La Maison du Whisky in Singapore, SGD 150. What do the folks at Gordon & Macphail have to say about this whisky? Aroma – Chocolate and sticky orange marmalade transforms into juicy plump stewed raisins and sweet baked apple, freshly cut grass notes delicately balance the rich sherry influences. Taste – Sweet and spicy: comforting butter candies weave with roasted hazelnut followed closely by orange zest, cinnamon, and mouth-warming pepper maturing into plum and fig jam. Finish – Long with highlights of chocolate and stewed fruit finishing with lingering winter spices. 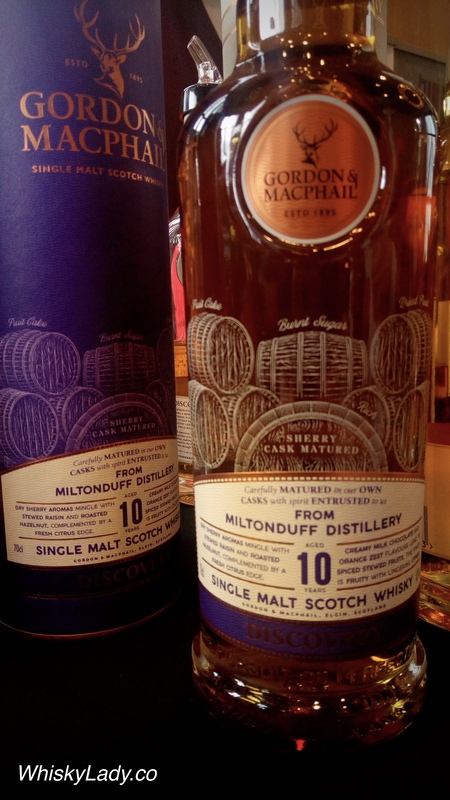 This entry was posted in Cask Strength, Scotland, Speyside and tagged Gordon and Macphail, Miltonduff by Carissa Hickling. Bookmark the permalink.